Hard water is a problem that many Cleveland, OH, homeowners face, but a water hardness test can help you understand the specific situation in your home. At RainSoft, we believe that homeowners should know exactly what’s in their water, so we provide professional hard water testing services that are fast, simple, and free of charge. When water has excessively high concentrations of hard water minerals, it can cause spotted glasses and dishware, grimy showers and sinks, dingy laundry, and even dry hair and skin. 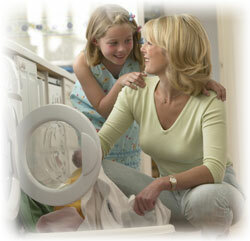 It can also cause water-using appliances to underperform and wear down more quickly than normal. However, many homeowners don’t realize that their hard water is the cause of these problems. We’ll provide you with test results right on the spot, and get you started with a list of possible solutions for the problems that you’re facing. Should your test indicate that your water is outside of the ideal hardness range, RainSoft can provide you with a top-performing water softener to meet your needs. We offer several excellent water conditioners for problematic hard water, as well as solutions for other types of water concerns. To schedule your complimentary water hardness test, call 1-800-RAINSOFT today. We’ll connect you with the authorized RainSoft dealer nearest your Cleveland, Ohio, home.